Feeling sassy? Well, we hope so, cause it's time for our new weekly challenge. Sassy Judy has a good challenge theme all set up for us this week. Congratulations to you, SALLY and thanks so much for joining us last week. 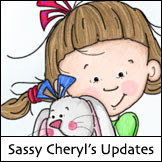 To claim your two free images from Sassy Cheryl's shop, just email Sassy Cheryl and she will get you all set. Have fun picking out some new things and have fun coloring them up! We look forward to seeing your new creations! 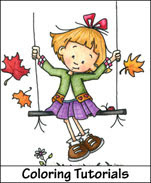 So get your supplies out and don't forget to include some stitching for this week's challenge. 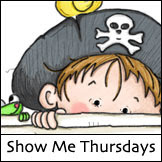 You can enter only once, and you can use any image you like as long as you follow our theme. 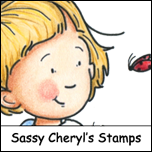 But we certainly LOVE when you use a Sassy Cheryl image and then, when you do, you get two entries in our random drawing. All of our very friendly rules are listed on this page. We're looking forward to seeing all of your lovely, sassy creations! Ladies, if there were a typing symbol for bowing to you, this block would be full of them. Fantastic creations, each and every one. Just fabulous cards ladies. Always amazing!!!!!!!!! Sally, congratulations! Just drop me an email and I'll get those FREE images credited to your account. Can't wait to see what everyone comes up with this week. Yippee!